ATLANTA — An intimate crowd of more than 50 family members, friends, faculty members and staff filed into a meeting room in the AT&T Midtown Center downtown. The room, decorated in Grambling State University’s traditional black and gold, is where the 2017 fall commencement ceremony took place for six special graduates. 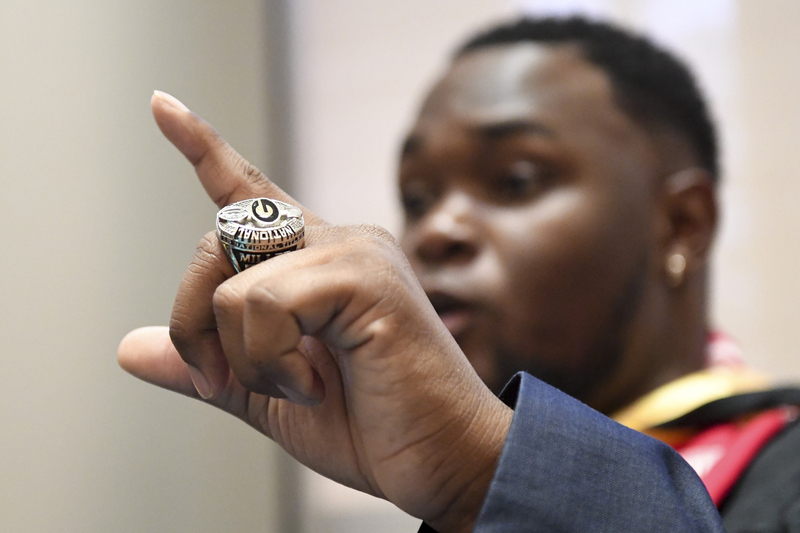 As student-athletes, their obligations to the Celebration Bowl, where Grambling will take on North Carolina A&T State University at the Mercedes-Benz Stadium in Atlanta on Saturday, took them on a 530-mile road trip just days before their commencement. But faculty and staff members wouldn’t allow the distance to derail one of the most important days of the students’ lives. Instead, the meeting room would be turned into their own miniature graduation ceremony. The leveled platform would be transformed into a stage, and a projector, generally used for presentations, became a simulcast for those in Atlanta to participate in the ceremony back in Grambling, Louisiana. 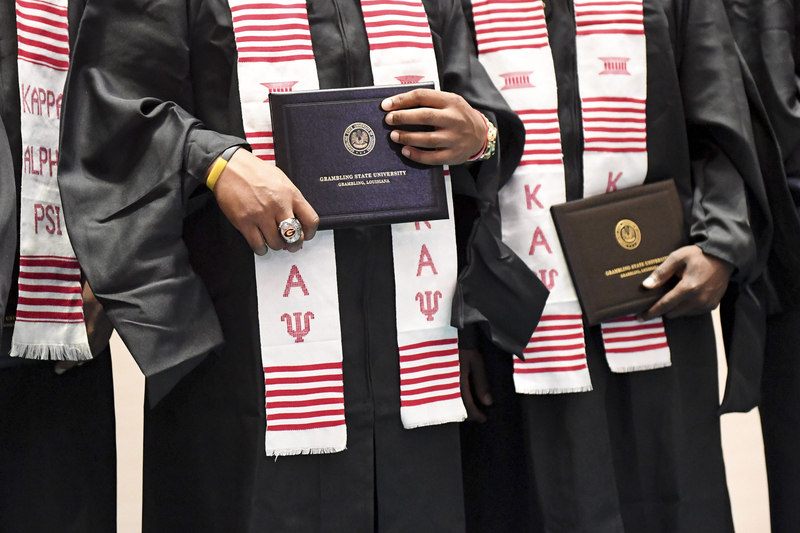 Grambling alumnus David J. Aubrey, a director of external affairs at AT&T Louisiana, helped coordinate the mini-graduation that unified the official and unofficial ceremonies in Grambling and Atlanta. The graduation ceremony tradition started last year during the second annual Celebration Bowl, when Aubrey realized there was a better way for students to be included on their special day. Besides finding a location less than five minutes away from the team’s host hotel, Aubrey also ensured that the simulcast would be smoother than last year for graduates to get the full experience. This year, students participating in Atlanta’s ceremony were able to interact with fellow classmates back in Grambling. “Our motto at Grambling is: Where Everybody is Somebody. This lets you know that, despite the fact that they’re here because of athletic responsibilities, academics are still first and foremost important to us,” Aubrey said. After opening remarks from Grambling’s president Rick Gallot, the invocation, a statement from Grambling’s valedictorian Prentiss Smiley and commencement address from pastor Frederick Haynes III of Friendship-West Church in Dallas, the student-athletes lined up alongside the makeshift stage, waiting patiently for their names to be called. The young men beamed. 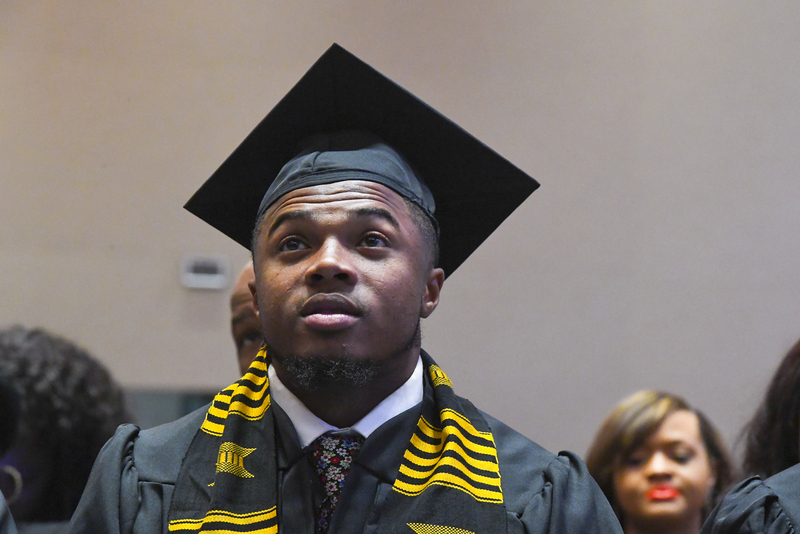 Although they were away from friends and family, they still stood with smiles plastered across their faces, awaiting the moment they’d proudly declare themselves alumni of Grambling State University. 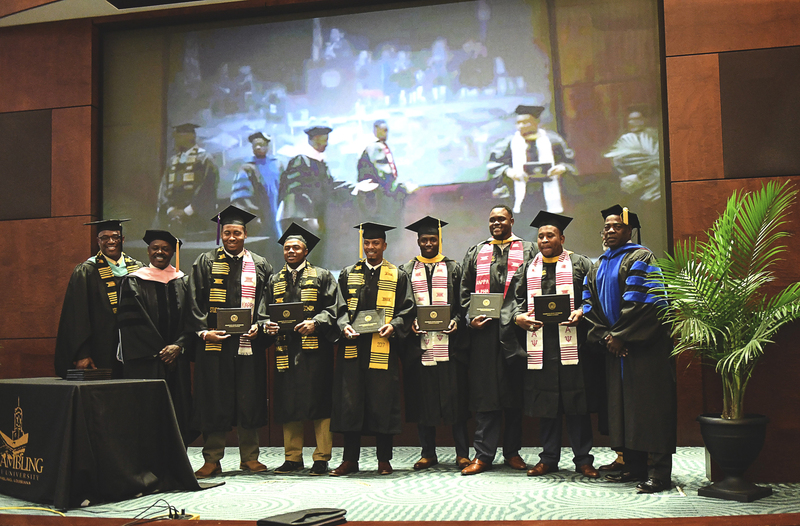 Among the graduates stood Christopher Johnson, De’Aumante Johnson, Ryan Burton, Justin Miller, Jonathan Wallace, and Martez Carter, Grambling’s star running back who has played a key role on the Tigers’ offense during his career. As the second-oldest of his 11 brothers and sisters, Carter is the first to graduate from college. Although his family couldn’t be in attendance, Carter still took time to reflect on what the day meant to him. Although this day tops the list as one of Carter’s biggest accomplishments, the focus now shifts to Saturday’s Celebration Bowl, where Carter is expected to play a large role. But Friday, it’s all about the degree. 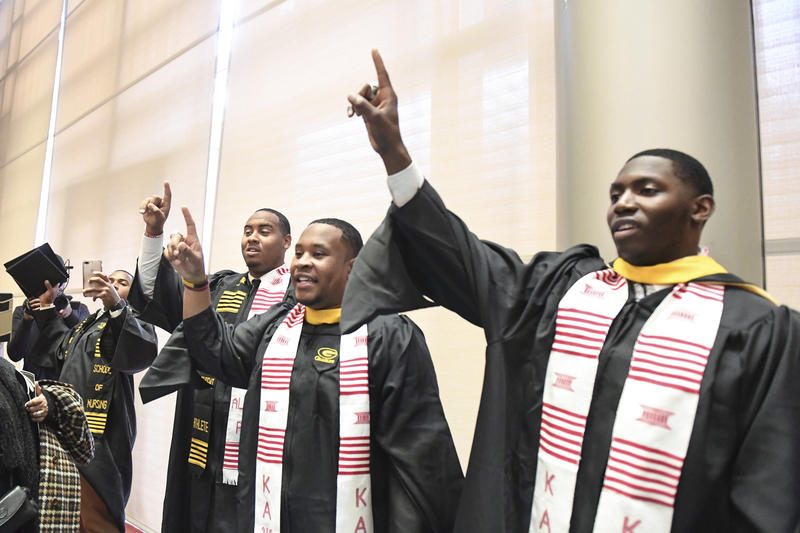 Once the last name was called, the six graduates, now able to turn their tassels from the right side of their graduation caps to the left, all gathered in the back of the room to participate in the alumni pledge, Grambling State University alma mater and traditional cap toss. The ceremony may have been in a meeting room of the AT&T Midtown Center in downtown Atlanta, but the love and support that spanned 530 miles from those in Grambling made the special day feel just like home.